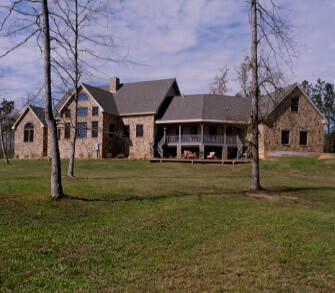 This expansive East Texas home sits on acreage that ranges from rolling pasture to deep pine forest. The owners worked with Red Suspenders Timber Frames designer Tim Chauvin to develop a house which features a soaring great room, well appointed kitchen, cozy bedroom spaces and even an exercise room above the garage. This home, in addition to being both beautiful and comfortable, is highly energy efficient and easy to maintain. The frame was fabricated of kiln dried Southern Yellow Pine. 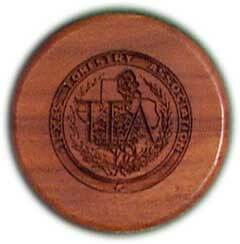 You can learn more about this and other timbers in our sawmill section on this website. The front elevation of this home features a full length porch that not only directs visitors to the front door and protects them while they wait for it to be answered, but also shades the home from the intense southwest sun during the summer months. 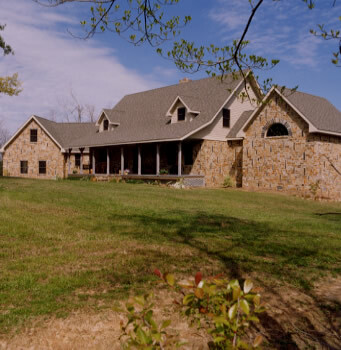 The stone and cement fiber siding provide an appealing and low maintenance exterior. The rear elevation also features an extensive porch. This elevation exhibits the extensive east facing windows of both the great room and master bedroom. Above the garage on the right is an exercise room. The laundry room, pantry, and utility bath are housed in the angled section that connects the main house and garage. The angle section allows the home to follow the natural contour of the land and minimized the need for extensive earth moving. The front porch leads into a grand entry that features the stairs to the second floor with room left over for a number of people to doff their coats before heading into the great room. After passing to either side of the grand fireplace that separates the entry and great room, you see the grand bank of windows facing the morning sun. The ceiling is white washed pine boards milled by Red Suspenders from the same logs from which the timbers were sawn. When you turn around you see the grand fireplace as well as the loft above the kitchen and dining room. 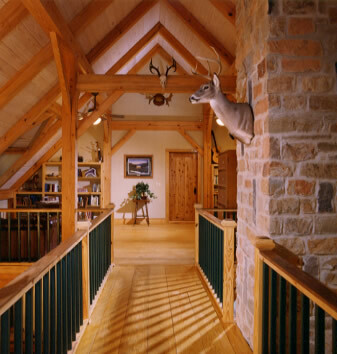 The bridge that passes behind the fireplace connects the loft to the upstairs bedrooms. 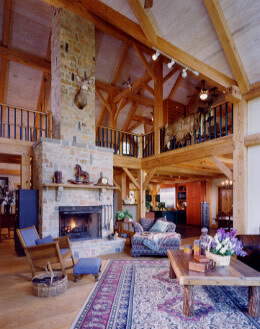 This expansive space allows the timber frame to shine on all levels of the home. 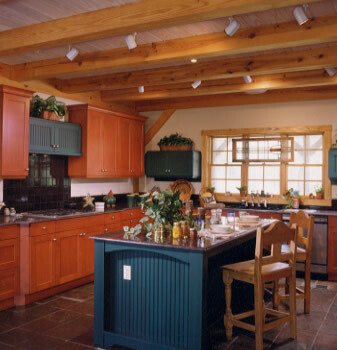 It is typical for our designs to feature flat ceilings in the kitchen and dining areas. They make the spaces more intimate and comfortable. Even through the ceiling here is flat, it is not low. The floor to ceiling height is 10 feet. Also typical is the large window providing natural light. Adjacent to the kitchen is the dining area. The French doors lead onto the back porch while the windows overlook the back yard. As in the great room, the ceiling is white washed pine boards. The owners white washed the boards themselves over several weekends before our crew arrived for the raising. 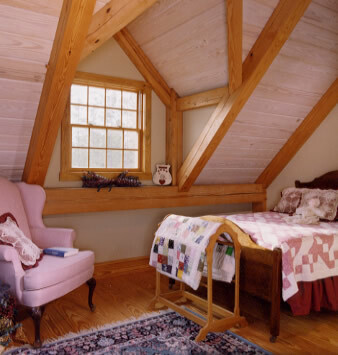 The Master Bedroom is a separate timber frame connected to the main house by a short connector that encloses a small hallway and master closet. 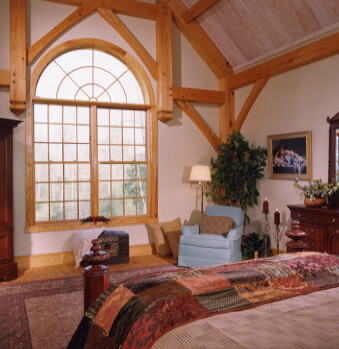 This arrangement allowed us to give the master bedroom cathedral ceilings, extensive windows and privacy. The frame features a graceful hammer beam truss. 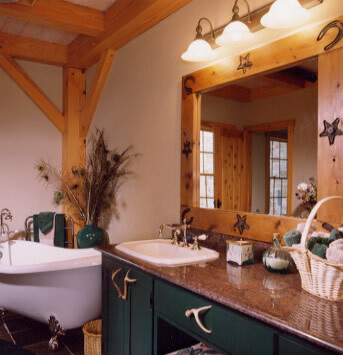 The Master Bath features a graceful claw foot tub and granite topped vanity. The pulls on the vanity were made from deer antlers the owners found. When you get to the top of the stairs, you can either go left or right. Going left takes you across the bridge that leads to the loft library. The door in the loft leads to the exercise room. If you turn right at the top of the stairs, you step into a cozy bedroom. The dormer provides light, some extra headroom and the opportunity for the timber framer to exhibit some elegant compound joinery. 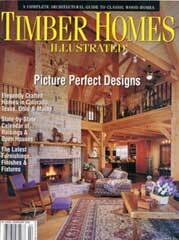 Presented to Red Suspenders Timber Frames, Inc. Fall 2001 for the Livingston Home.